The other space combat sim brings you to a hundred gazillion stars in style. X-Wing was my jam in 1993. I flew those A-Wings, Y-Wings and X-wings on every mission, shooting down TIEs with reckless abandon. It made me get a joystick - I didn't really need one before - and even now listening to Smashing Pumpkin's Siamese Dream album brings back memories of a star field. X-Wing was great, but it was a linear mission-based experience. What the new boom in space combat sims offers is a continuous, seamless open galaxy to explore and exploit however you want. All the way back in 1984, Elite was the first game to use procedural generation to create a believable galaxy on the BBC Micro computer in England. 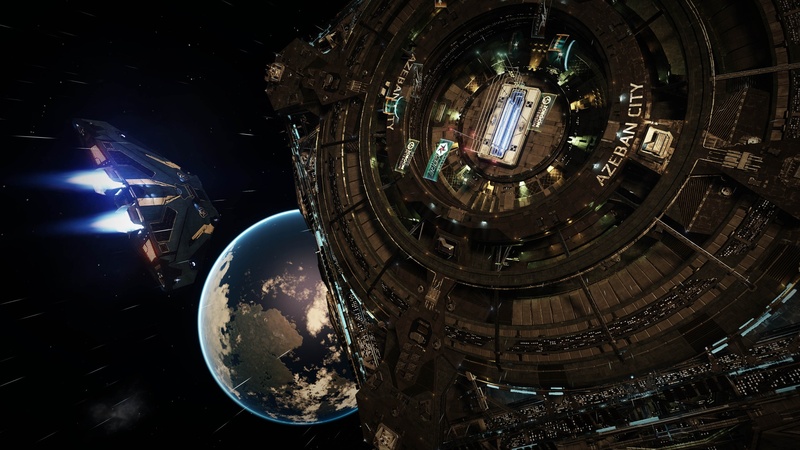 David Braben was the co-creator of Elite, and he's taking advantage of a successful crowdfunding campaign, his 30 years of experience and his own graphics engine to bring Elite Dangerous to PC this year. From what I got to play at E3 2014 this week, it is absolutely incredible in its scope, without skimping on details. 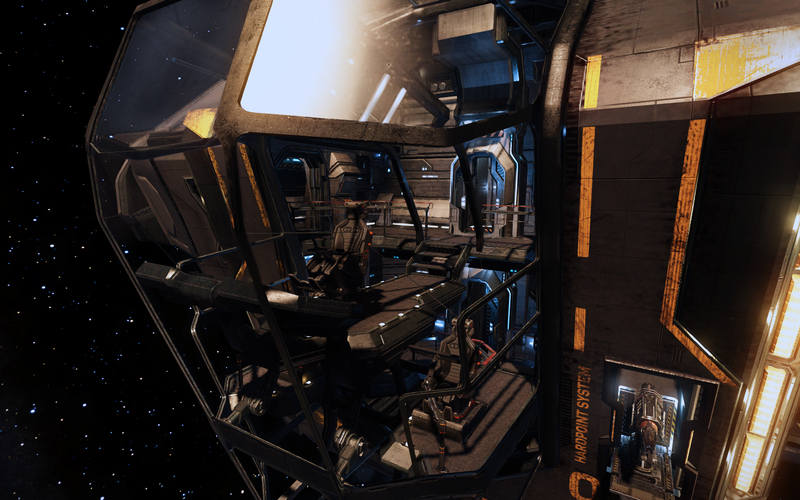 Add the support for the Oculus Rift and you've got a game you need to experience if you ever wanted to feel like you are actually in the cockpit of a spaceship. I sat down and grabbed a hold of the right joystick, and the left throttle control. 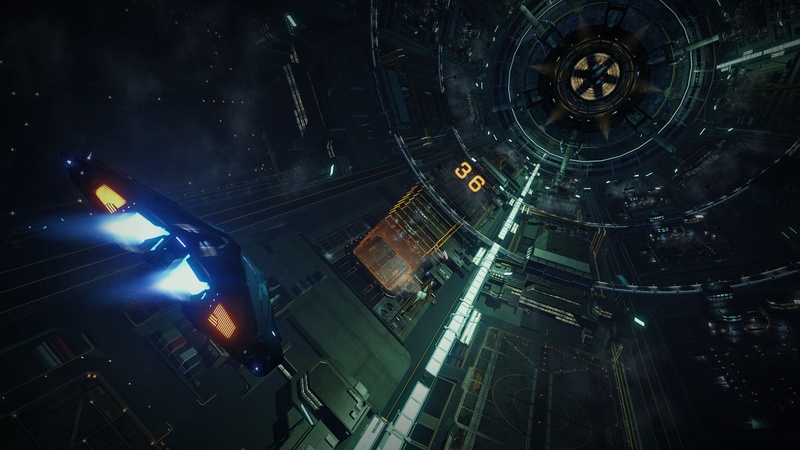 One of the super backers of Elite Dangerous gave me a quick tutorial. My ship was in the hangar, and my first task was to pilot it out of space dock. The joystick was extremely sensitive at controlling pitch and yaw, and the throttle could be a bit twitchy, but after the launching system brought my ship out of the huge cylinder, I was indeed able to squeeze my way out of the small blue opening and got out into space. After I cleared the opening and the floating advertising billboards in space, it was incredibly satisfying to throw back the throttle and cruise. Space is beautiful, and it is wonderful to just look at the planets, suns and asteroids in Elite Dangerous. Between systems, you can enter a faster than light travel mode which will let you traverse distances quickly, but you still have to pilot your ship. My handler said I should head to a mining facility inside the flat disk ring of a large gas giant planet. Dropping into combat speed, I was suddenly brought close to the rings, which became huge asteroids rolling and spinning. Glorious. "Have you seen the star map?" the demonstrator asked. "No." He called it up and explained that the 3D map includes stars that we know exist, such as Proxima Centauri and Barnard's star. Elite Dangerous has about 100,000 stars near the Sol system that our astronomers know about accurately represented in the game. It was incredible seeing these stars in three dimensions all around you. But then, we kept scrolling out, and scrolling out, scrolling out and the entire breadth of the Milky Way galaxy was finally revealed. I felt infinity punch me in the gut. I was in the Total Perspective Vortex - it was a really stirring demonstration of what an accomplishment Elite Dangerous is. The game blends the knowledge of stars we know about into stars and systems generated to approximate the randomness of space. 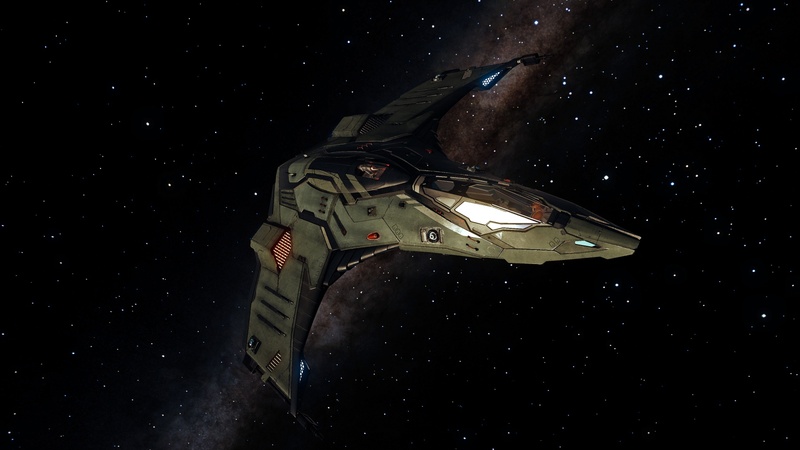 There are 300 billion stars, and you can go to any of them in your ship. It's important to note here that Elite Dangerous is a multiplayer game. There will be others out there exploring the galaxy. It is David Braben's hope that when you encounter another living soul out in the infinity of space, it will be possible to forge relationships. Respectful alliances will be enforced by large bounties placed on pilots who kill other human players. Braben didn't like Ultima Online's system of player killing, and he hopes the large bounties and strict rules on griefing will prevent that culture from appearing in Elite Dangerous. Of course, it also creates players who enjoy bounty hunting, so we'll see. The genre descriptor of "space combat sim" means there's going to be some fighting. For this portion of the demo, I put on the HD Oculus Rift dev kit. Using the head tracking and the 360 vision, I could see all around the cockpit. A cool detail - looking to your right or left brings up different consoles and portions of the UI that was only accessible through a button press before. Once the enemies came at me, it was simply intuitive to follow their motion with my head. Looking up, I could see where the ship went and try to predict what direction to pilot my ship to intercept them. Weapons fire is a simple trigger, but the heat seeking missiles required target locking. The details don't matter. I was hooked. For a few minutes in a busy convention center in Los Angeles, I was one with my ship. I was Rogue Leader, I was Starbuck, I was the Last Starfighter. I loved it. Elite Dangerous is the reason I play video games. I can't wait for it to come out in 2014 - Braben couldn't give me a date but he said it will be this year for sure - on the PC. And it will be the reason I get Oculus Rift.